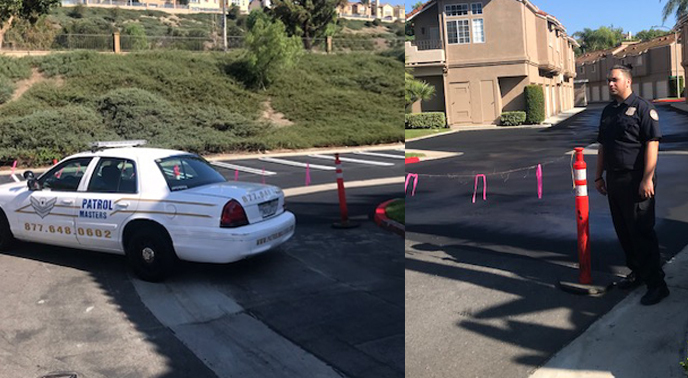 Parking is at a premium in Southern Calif., especially in Orange and the surrounding counties, in which Patrol Masters Security is very active enforcing the parking rules for . As the area grows and develops, parking becomes even more of an issue and parking spaces more scarce. The systematic monitoring and control process of this valuable resource is essential for us all, not only in terms of economic value and traffic but also in terms of safety and quality of life. Patrol Masters Security is proven and established itself as a expert on Parking Enforcement issues. With the help of our legal experts, we provide you with tools to fully manage this valuable real estate in several ways. We will help you establish or improve on your existing signage for maximum efficiency and minimum visual impact. We will establish, upgrade and optimize your ticketing systems for proper enforcement of parking rules. We will manage the towing procedure, if a vehicle must be forcibly removed from your premises. All of this is done with the help of our legal team, who will conduct a comprehensive analysis of parking laws instituted by state and local authorities, including the laws and ordinances of your community. Periodic Patrol inspections to a certain location, on nightly basis as frequent as the clients deem necessary to fit their needs. Patrol inspections vary in length but expected to be anywhere between 10-15 minutes per inspection. Inspections are in a 24-hour period, seven days per week and may be day or night, as you direct. Duties are agreed upon prior to commencement of service, which includes, locking up the facilities, unlocks, parking enforcement, crime deterrent, etc. With summer comes increased pool usage by residents and their guests; including out of school youngsters and their friends. A proactive approach to controlling pool activity can preclude problems, reduce liability and ensure a quality experience for all pool users. 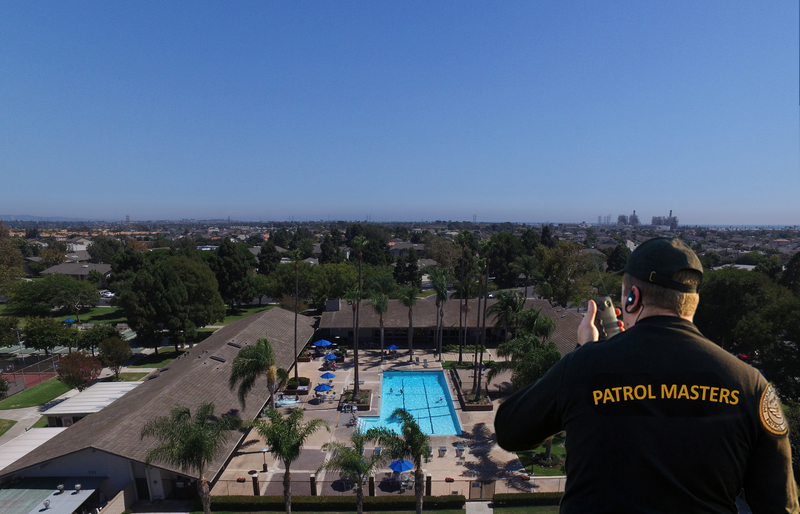 Patrol Masters Security offers two distinct solutions to help solve summer-related association problems. The matrix and proposal below outlines the differences between our Pool Monitor and Pool Patrol services. Shifts: Due to the extremely tight labor market, our shifts are no less than eight hours in length; we are unable to contract for less than 40 hours per week. Short shifts are difficult to fill with quality personnel and turn-over is high when hours are low. If your association suffers from the following problem, please read on. We have the solution. The Problem: Residents don’t use their garage spaces for their vehicles but use the space for all kinds of things other than a garage. Therefore, guest can not find a parking space. Source of the Problem: Residents using their garages for storage of everything but their vehicles. Solution: Patrol Masters Security will carefully guide you through the process of establishing an effective and simple Parking Permit Program to encourage residents to use their garages appropriately and to create plentiful guest parking. This program encourages residents to utilize their garages to the fullest extent possible as envisioned by the architect who designed the association’s homes. It will open up parking for guests and those have more vehicles than garage spaces. The program requires action by those residents who either have more vehicles than garages spaces or who have treated their garage space(s) as though it were something other than a place to park their car. For example, they have stored furniture, gym equipment, an office or pool table taking up parking space in their garage. Please ask for your copy of our "Detailed Parking Permit Program" if you need this service. Our patrolmen are trained in the latest patrol methodologies and motivated to conduct thorough inspections of the premises. Every nook and cranny is regularly and thoroughly patrolled. 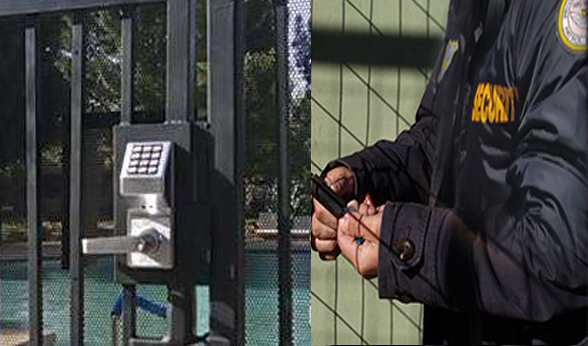 We can help you secure on-site recreational facilities, pools, common areas, and laundry rooms by enforcing lockup and unlock protocols at pre-established times. In the event that your alarm system is triggered, quick response by an experienced, professionally trained security officer is critical. The monitoring control center dispatches a qualified security officer to your location to perform a thorough investigation. With our exclusive 24 hour a day, 365 days a year alarm response service, our reliable, uniformed security officers will respond promptly to your alarm. Professionally trained security officers will investigate alarms and take the necessary steps to ensure your property is secured. 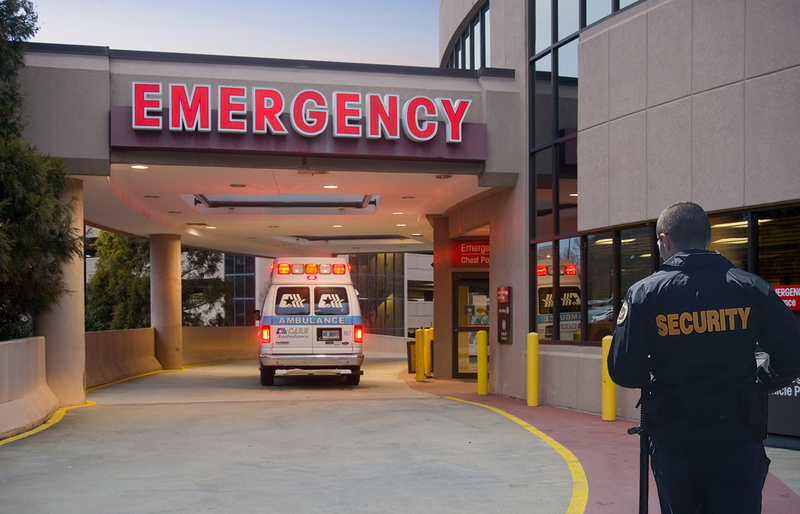 Should they verify a real emergency, they will immediately contact the appropriate authorities – police, fire or ambulance. Traffic Management and redirection services by our officers will prevent vehicles from unknowingly driving over wet slurry. We will maintain a presence from the moment the slurry is poured until it dries up – usually the next day – or for as long as required by the client. Fumigation is a method of pest control that completely fills an area with gaseous pesticides to suffocate or poison the pests within. It is utilized for control of pests in buildings (structural fumigation), soil, grain, and produce, and is also used during processing of goods to be imported or exported to prevent transfer of exotic organisms. 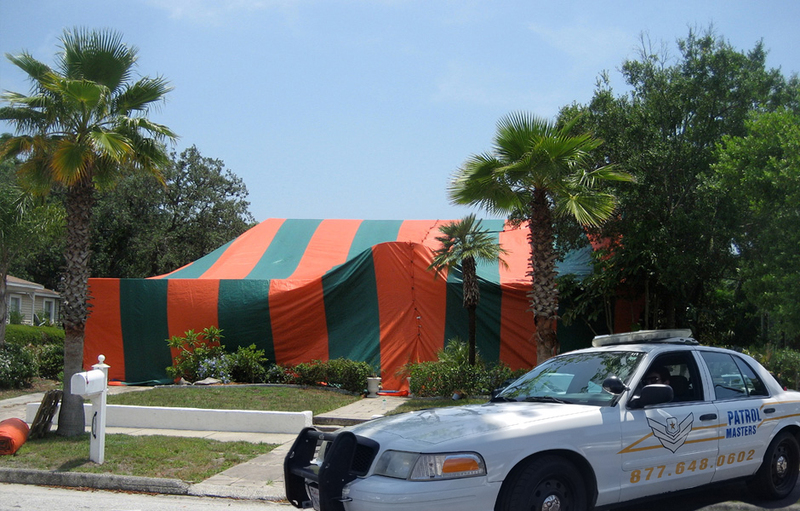 Structural fumigating techniques differ from building to building, but in houses a rubber tent is often placed over the entire house while the pesticides are being released into the residence. This concentrates the gases as well as keeps them from escaping and doing harm to people in the neighborhood. During this time the residents of the house must find an alternate residence for up to a week depending on the fumigant used, which in turn depend on the severity of infestation and size of the house. Most fumigants are highly toxic to people, and there are many deaths each year. When structures are fumigated, people are forced to leave their homes and valuables until the fumigation is completed. Patrol Masters Security provide security to your unattended home to prevent burglars from entering your home or building. At the same time, we prevent anyone from entering the hazardous toxic area until its safe, which helps prevent injuries and possible death to humans and pets. In its modern form, a gated community is a form of residential community sometimes characterized by a closed perimeter of walls and fences, but always containing controlled entrances for pedestrians, bicycles, and automobiles. Gated communities usually consist of small residential streets and include various amenities. For smaller communities this may be only a park or other common area. For larger communities, it may be possible for residents to stay within the community for most day-to-day activities. 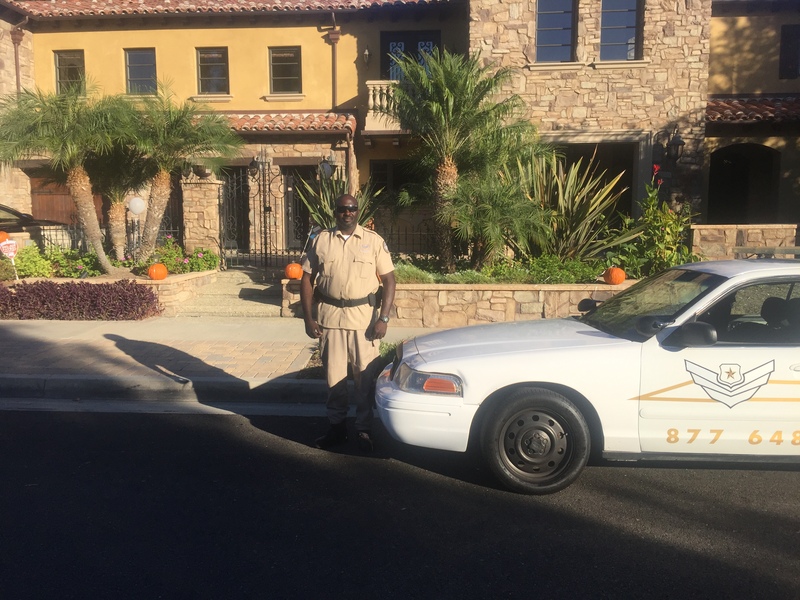 Most gated communities, usually called guard-gated communities, are staffed by private security guards, often with CCTV and other electronic aids. These communities are often home to high-value properties. Some gated communities are set up as retirement villages. Real estate developers design and build gated communities because buyers want them; the existence of walls and gates around a community enhances the value of the homes located within. Many homeowners prefer to live in gated communities, just as many apartment dwellers prefer secured buildings, not only as a deterrent to crime, but also to enjoy privacy and peace of mind. Physical walls, in some cases fortified and surveilled, give the inhabitants a sense of security. In 2000, eight million U.S. residents lived in gated communities. In many parts of the world, buyers are expressing a preference for gated communities. While many see living in a gated community as offering increased security, they are not impenetrable. Walls are frequently low enough for someone to climb over them. Gates can be bypassed by tailgating cars and, for those willing, access through the sewer system. Pedestrians can enter by means of pedestrian gates, which are generally unlocked. Patrol Masters Security qualified gate attendants provide access control to the community residents and guests. Ensure that the admittance criteria is as specified by the client, are used in all cases. Provide the highest quality of service to the residents and their guests. As a means of controlling access to the community they may issue permits, guest passes and track that information in a computerized database. What is your firm's corporate philosophy? How do you assure high quality of service? How do you ensure a cost-effective service to the client? What other services are provided by your company that may be of interest to our Community? Why do you feel that your firm is particularly suited to serve our Community and Residents? What support from our Homeowners Association is recommended to achieve the best results from your security services? What is our firm's corporate philosophy? Our mission statement: "Provide our clients with TSS, Tailored Security Solutions while maintaining unparalleled professionalism, service, and satisfaction." We are built on three goals: maintain absolute integrity in all business dealings; provide excellent service to our clients at fair prices; and earn the trust of our customer and employees every day. With those three goals in mind, we build relationships with clients that develop into a higher level of service than you might have come to expect. 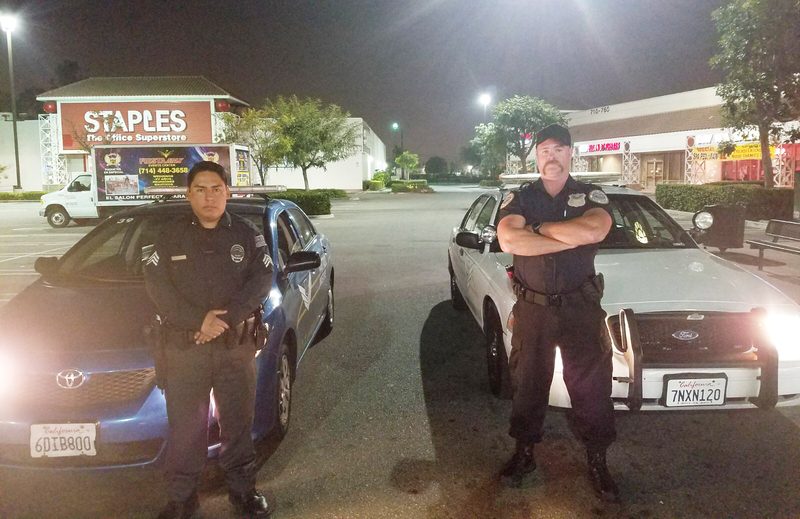 Our objective in partnering with your community is to OBSERVE AND REPORT any suspicious or criminal activity to the local police department. With our visible presence, opportunities of theft are decreased. We do not believe in selling more than you lose, to stay in business. As a matter of fact, we don’t have any sales force to speak off. We let our work and reputation sell for us. How do we assure high quality of service? We interview, employ and train the most motivated and self-confident individuals; we have systems in place to check employee performance while on duty. We track and evaluate officers reports, uniform standards, client input, and supervisors field inspection reports. We have also incorporated the "run the gate system" by asking our undercover agents to try to gain access to your community, unannounced, to see if the gate attendants are following procedures and gate admittance criteria set forth by the client. Our officers are equipped with the latest hi-tech devices to perform their work in the field, always in contact with dispatch and trackable via GPS for their safety and accountable to our clients. How do we ensure a cost-effective service to the client? Get it right the first time, which means screen, hire, properly train and supervise the right person for the right job from the start. By doing so, we reduce our turnover rate, which means less advertisements, less training costs associated with training new people over and over, which results in more profit, which means that the gate will run smoothly at a cost effective rate. Because our service areas are saturated with many communities we are able to provide more and better coverage giving our clients a better return on your money. Patrol Service: We provide the best patrol officers available and we back that with a guarantee; if you are not happy with our patrol service, don’t pay us. Our GPS system allows constant monitoring of our officers, the time spent on your property and most importantly, allows our clients to rest assured that they are getting what they pay for. This also helps if you should call in a response call, we are able to pinpoint which officer is in close proximity to your community for faster service. It also helps guarantee the safety of our officers in the field. Live monitoring, 24 hours a day: This system allow us to post cameras anywhere the client desires, (i.e. trouble areas, vandalism areas, pools, clubhouses, etc.). Each camera can be equipped with a microphone, which allows our Control Room Commander to communicate if needed. 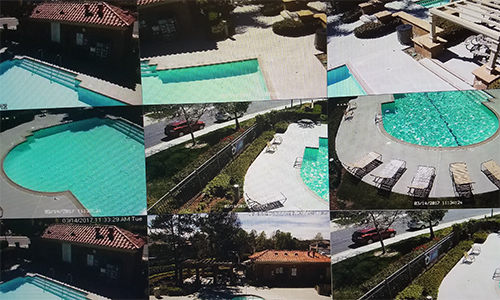 Every camera has a unique IP address that is available to our clients to use and monitor their properties as well, anywhere, any time. Free response to residents and Board member calls for assistance, on as available basis is free of charge and is not being offered by our competitors. 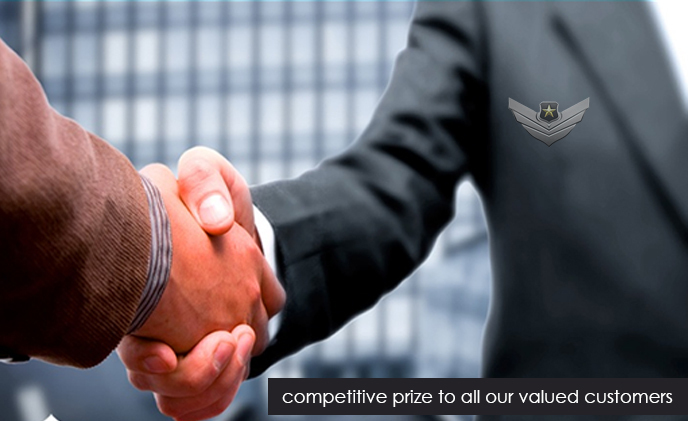 We truly believe that client satisfaction is the key to our future success. Our success hinges on absolute client satisfaction, therefore, all we require is a chance to prove that we can earn your business; we are very confident we will meet and exceed your expectations. With that in mind; we know Communities and their residents will be pleased with our performance. 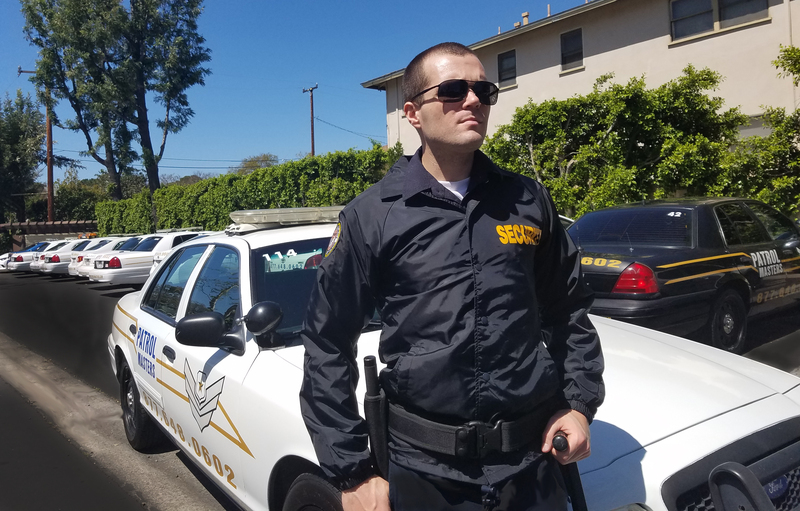 We are available to you and your communities 24/7 with LIVE friendly, knowledgeable and helpful customer service agents, employed by Patrol Masters Security and in Santa Ana, CA. We are members of and proudly support both CACM & CAI. We also encourage Board Member education thru the CLTP classes sponsored by approved vendors. Constant communication and feedback. Bring any deficiencies to our attention for immediate and swift resolution. Our Customer Service line is available to homeowners 7/24. Invite us to attend monthly or quarterly Board meetings. Keep us informed and allow us the chance to participate; in opinion only, in your discussion of any security related issues. Use our knowledge. We cannot stress enough the need for open Communications at all times. This service is also called standing officers service, which means that the officers are stationed in one location for the entire shift, which could be 6, 8, 12 or 24 hours shift. Shifts are set by the clients as they may see fits their need. Shifts may be day or night, as you direct. Duties are agreed upon prior to commencement of service, which includes, locking up the facilities, unlocks, parking enforcement, crime deterrent, etc. Patrol Masters Security does not offer armed officers. 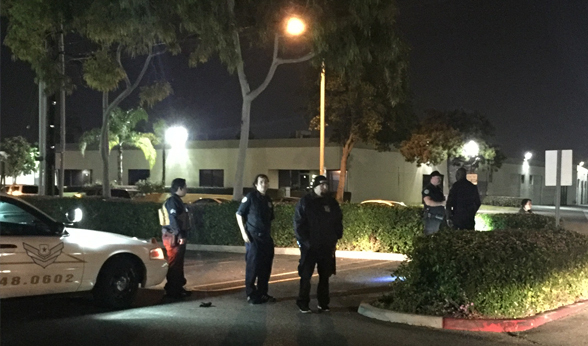 We do not believe that Orange County’s security needs would require an officer to carry a weapon. Our main duty as a patrol company is to observe and report. With that in mind, we instruct our officers to report immediately any unusual or suspicious activity, to local law enforcement agencies. In the case of an event, we are sure that law enforcement agents are much better trained to handle the situation than any security firm. Office buildings are a large capital investment. While most agree that security during hours of operations is necessary to protect the people within, it is also true that buildings require an attentive security system after regular business hours - particularly on weekends and during holidays – to protect this investment against unauthorized intruders and vandalism. Patrol Masters Security can manage the safety of your real estate by managing safety compliance and on-site and in-site accessibility. We can help you comply and conduct fire and safety inspections and manage access to designated facilities within your property by enforcing lockup and unlock protocols at pre-established times. Patrol Masters Security will ensure that all doors, windows, gates, access hatches and other means of ingress/egress are secured at all times during routine inspections. If an unexpected, unsecured avenue of entry such as a door or window is found open by our security officers, we will immediately notify the on call person. 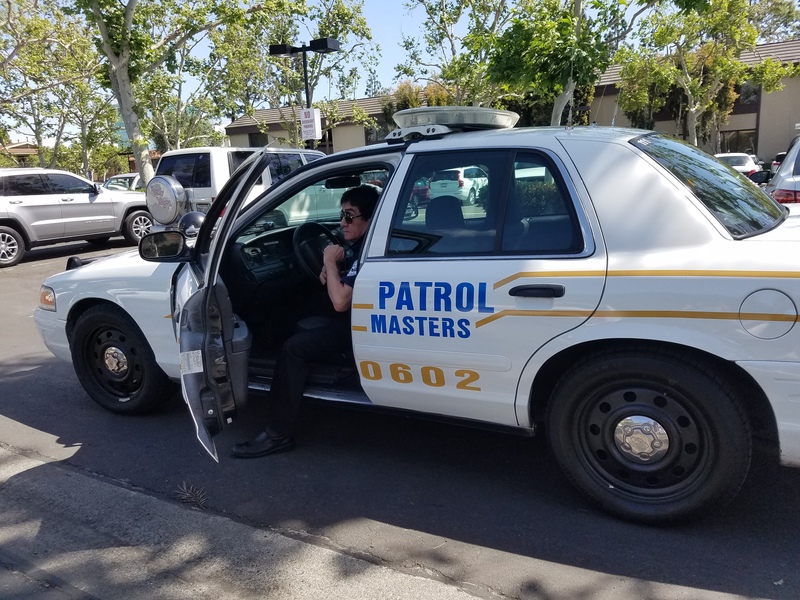 As an additional measure, Patrol Masters Security will record, document and when applicable, identify suspicious persons or vehicles found on-site. 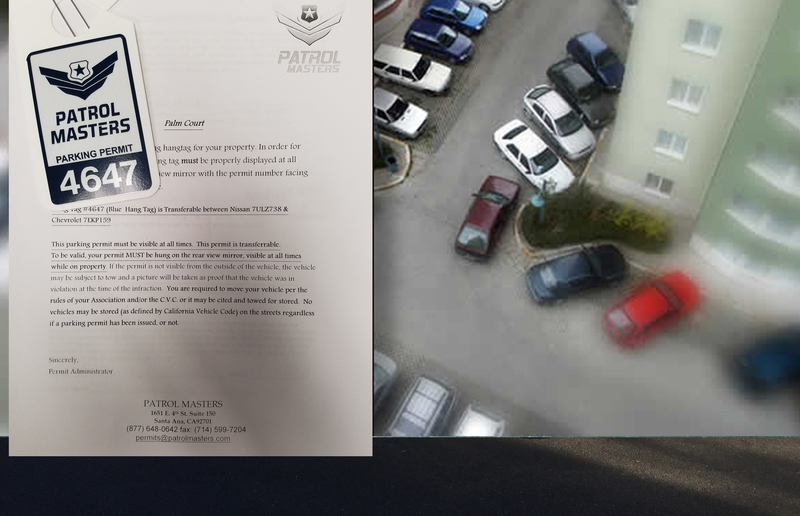 You and your tenants will not only be safe but also feel safe knowing that PATROL MASTERS is in total and thorough control of your building. 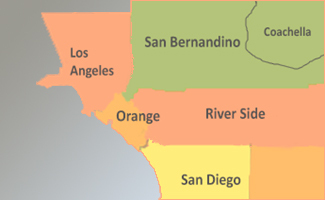 Concentrated population areas present many opportunities for Patrol Masters Security to be of service to owners, property managers and boards or directors. Our security consultants will analyze your residential property, assess and recommend additional safety features that might be needed. 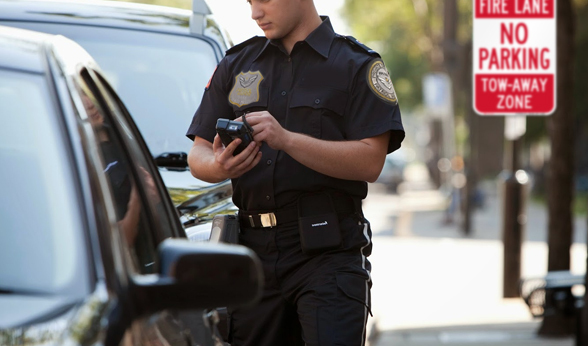 We are also experts in residential-area parking enforcement, effectively managing your parking enforcement management. Our distinctive patrol units and personnel, effective patrolling techniques and thorough spotlighting techniques ensure a high security profile, keeping the criminal element away from homes. Shopping Centers and malls often attract nuisances such as loiterers and other unsavory individuals whose behavior is undesirable or have a negative effect on the shopping center’s atmosphere. We will act on your behalf to patrol the center periodically and rid it of unwanted guests with minimum commotion. Patrol Masters Security can be your eyes and ears when management is unable to be constantly on-site. As your eyes and ears, we will report any malfunctions that may have an adverse effect on safety such as faulty lighting, sprinkler systems, and abandoned cars, arranging for their removal. For added security, we can also conduct lockup and unlock protocols at pre-established times on front and service doors for merchant stores. We will offer very competitive pricing to all our clients. We will not submit a bid until we have examined the site you wish us to secure, which gives us better understanding of your needs and able us to bid and price accurately and fairly. We field more patrol vehicles on 24/7 basis than any of our competitors, which allowed our prices to be very competitive if not less than our competitors. 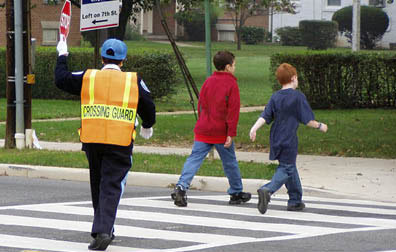 Patrol Masters Security Inc. provides crossing guards service for the City of Carlsbad and have been for the past (4). We have total of (45) well trained crossing guards. We assist children on their way to and from school in safely crossing roadways and intersections. We watch for gaps in traffic and walk children across the roadway or intersection while holding a "stop" sign in such a manner as to be visible to approaching vehicles. To provide for the safe movement of children to and from school when crossing public roadways and intersections by observing gaps in the traffic and leading the children across the roadway or intersection.